So for my 29th birthday, Mike got us season passes to Universal Studios & Islands of Adventure (we had Disney Annual Passes for 2 years prior to this)! We got the Premier Passes which are the best! No blackout dates, free premier or valet parking, express passes after 4 AND we each get a ticket to Halloween Horror Nights....sweeettt!! We went up the Sunday before my birthday and had such a great time! 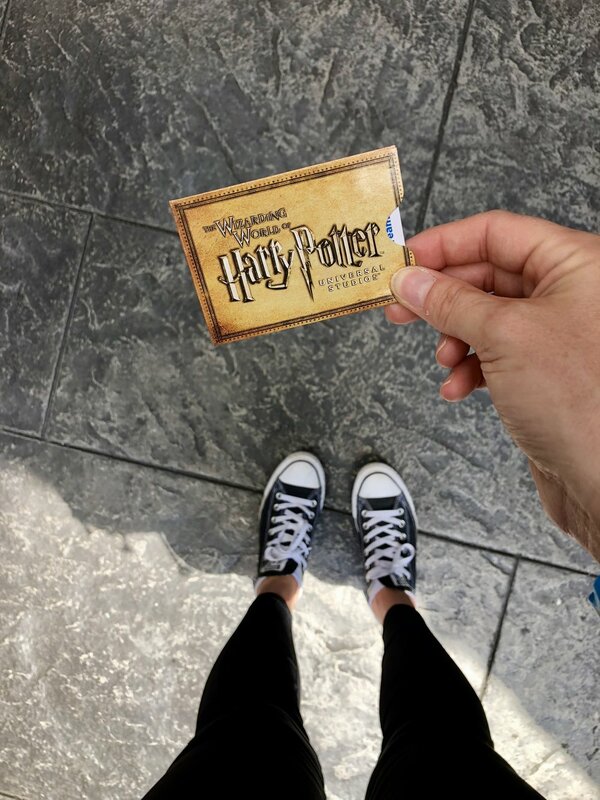 It's been a minute since we have last been to a theme park and a little Harry Potter in my life was just the ticket! (for Platform 9 3/4 to be exact). First stop was of course Voodoo Donuts! I have be dying to go ever since I heard they were putting one in City Walk. They have more than 10 vegan donuts and it was a must do! Well Oh. My. Goodness......they DID NOT disappoint. I should have taken a box home with me. I got the maple bar and Mike got the apple fritter.......life. Then we were off to Universal Studios to explore Diagon Alley! 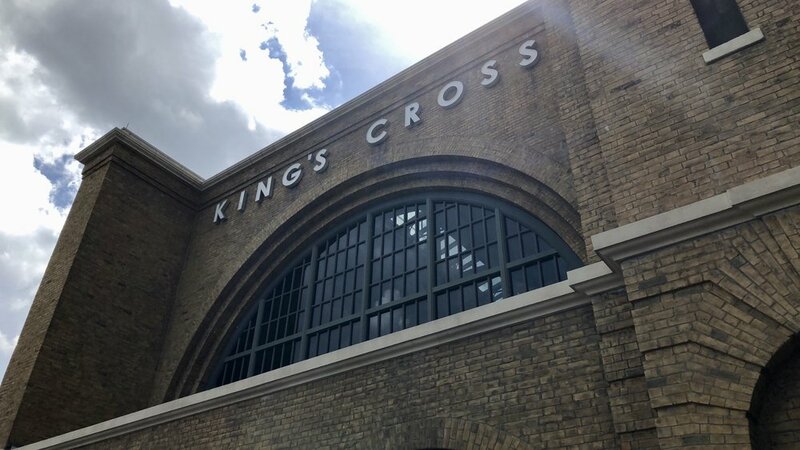 Before you walk through the brick wall, you walk past Kings Cross Station, The Night Bus, a Telephone Booth (where you can even call the Ministry of Magic!! 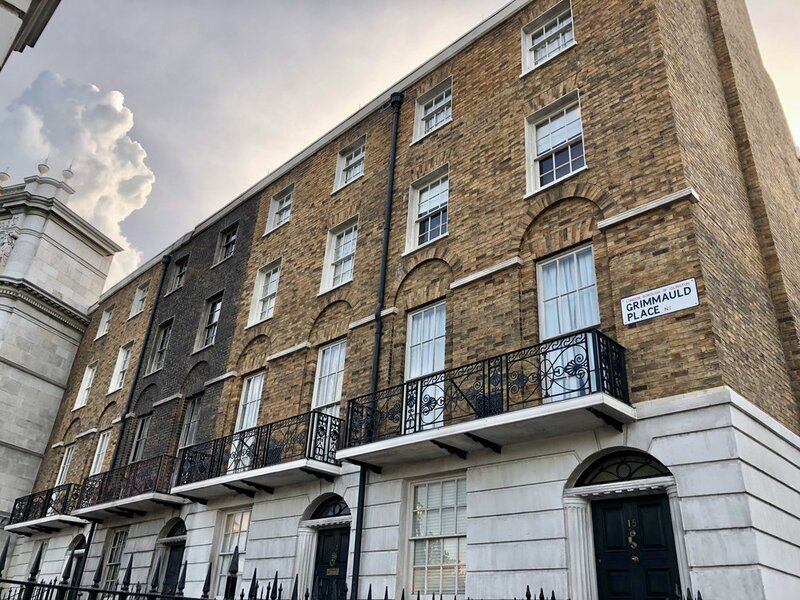 ), and Sirus's childhood home Grimmauld Place. If you watch at the right time, you can see Kreecher peaking his head out the window! 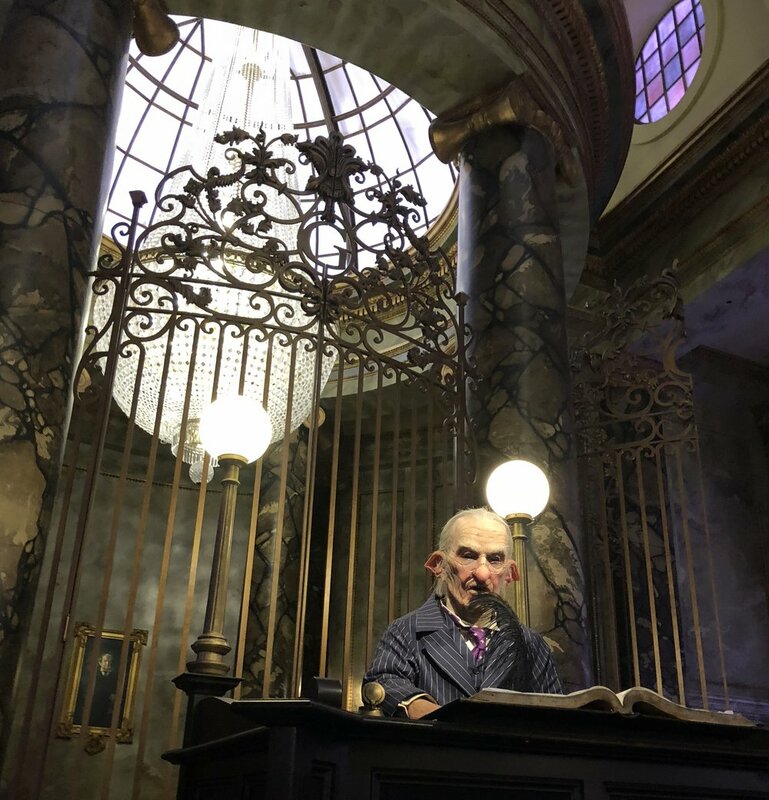 Once in Diagon Alley, we hopped right onto the Escape from Gringotts......"there's yer money, Allie"! This ride is one of the best! The bank is so authentic, from the outside entrance to the goblins working the bank. For the ride itself, you hop on the cart and it wisks you through the tunnels and vaults while fighting off Voldemort & Bellatrix! It has been named one of the top rides ever! 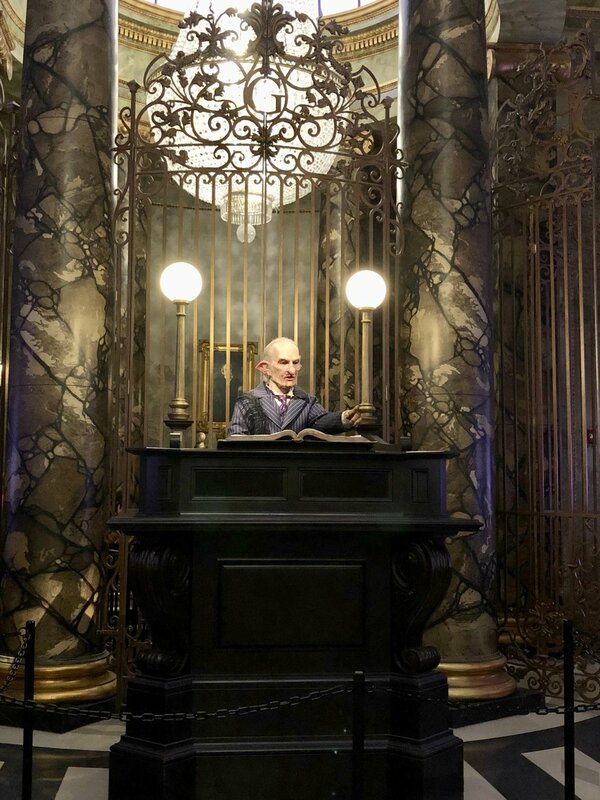 You can even go into the Gringotts Money Exchange where you can trade your muggle money for wizard money that can actually be spent in The Wizarding World of Harry Potter. Afterwards, Mike enjoyed a frozen Butterbeer and I got a Wizards Brew Beer while we shopped for my school supplies....just kidding. (no, no I'm not). There are so many places to explore including Weasleys' Wizard Wheezes, where you can purchase all their creations such the Love Spell Potion, Puking Pastilles, and Extendable Ears. Knockturn Alley is a super dark and dusty place, just as it is in the movies and books. There you can go into Borgin and Burkes where you can see the Vanishing Cabinet that the Death Eaters used to gain access into Hogwarts in book 6 and purchase dark magic items such as Death Eater Masks, Horcruxes, and more! For dining, there is The Leaky Cauldron where they serve traditional English breakfast, lunch, and dinner. The Tales of Beedle the Bard performance show can be watched during certain times as well! Diagon Alley is everything you would expect and is just as you see it in the movies. Next it was off the Hogwarts Express! To find get onto Platform 9 3/4, you must enter through King's Cross Station. If you ask any of the employees working there about Hogwarts, they will know "nothing" about it, because you are still in London. "Excuse me, excuse me. Could you tell me where I might find Platform 9 3/4?" "Platform 9 3/4? Think ya being funny, do ya?" You have to walk through the station with the rest of the muggles and "all you've got to do is walk straight at the wall between platforms 9 and 10. Best do it at a bit of a run if you're nervous" to get to the Hogwarts Express. (There is even a place where you can stand back and watch your friends and family walk straight through the wall onto the platform. If it isn't too busy, you could get some awesome photos and videos. There is luggage all around the station and you can even spot Hedwig on the platform, with Harry's luggage, waiting to head back to school. Once on the train, it only takes about 3 minutes to get to Hogsmeade from King's Cross. During the ride there are a few magical things that take place in your compartment, such as a Dementor sighting perhaps, or possibly Harry, Ron, and Hermione walking down the hallway. Next it was off to Hogwarts! Waiting in line for this particular ride isn't too shabby! You get to explore the castle rooms like Dumbledore's Office, the Defense Against the Dark Arts Classroom, the Greenhouse, Gryffindor's Common Room and get to see the Sorting Hat. Even the Hogwarts Portraits are talking and moving around, including the Fat Lady......"ah, just with my voice." 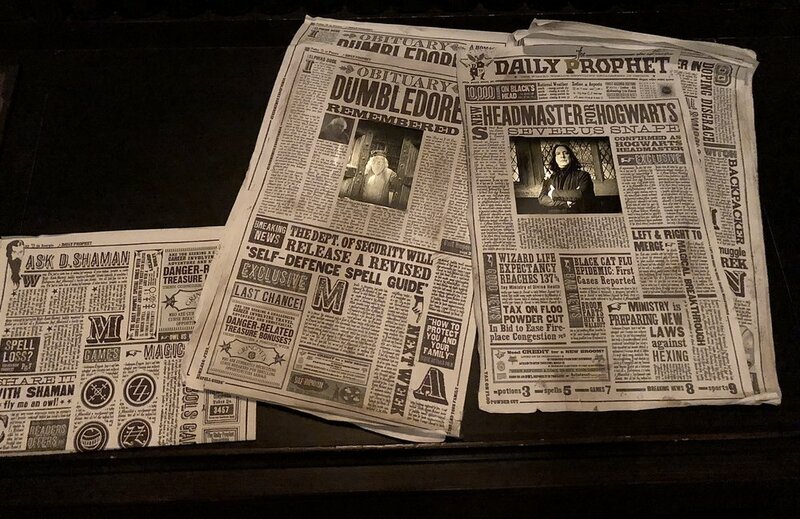 (If you are not a HP nerd like myself, you will not understand these references and for that, I apologize. BUT get with the program!) This ride is also another one of the best! Flying around with Ron & Harry, as Hermione helps all along the way. You get to fly through the Astronomy Tower, the Quidditch Field, and even into the Dark Forest! At the end of the day, we boarded the Hogwarts Express again, this time from Hogsmeade and headed home, "I'm not going home, not really. ", or at least back to King's Cross Station. Universal & JK Rowling have gone all out to insure the authenticity of every single detail, including adding actual props from the movies throughout the parks! If you have never been to the Wizarding World in Orlando, you need to add it to the list. Thank goodness we now have season passes, so I will be be exploring a lot more over the next year! Please Note** You must have Park to Park passes in order to board the Hogwarts Express.